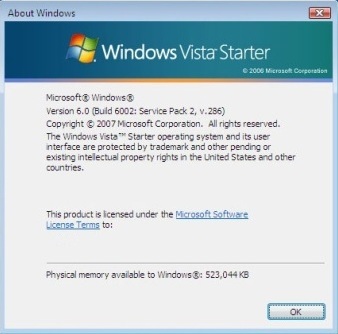 As previously reported, Microsoft has released the official release candidate version of Windows Vista SP2 and Windows Server 2008 SP2 (both is KB948465) to selected testers via Microsoft Connect and Windows Update, with build version 6002.16670.090130-1715, compiled on January 30, 2009. The true Windows Vista SP2 RC and Windows Server 2008 SP2 RC (both is same) has been leaked. The SP2 (Service Pack 2) for Windows Vista and Windows Server 2008 has the same standalone setup installer. Windows Vista SP1 (note: if you install with Windows Vista with SP1 DVD x86 or Windows Vista with SP1 DVD x64, the system has SP1 installed too) is required to be installed prior to install SP2. Windows Server 2008 ship with SP1 pre-installed, thus does not need any service pack requirement. Note that the Service Pack 2 RC build 6002.16670 is a RC release for testers only. Public user should wait for final release which should arrive in April.